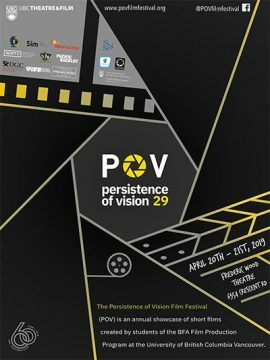 UBC’S PERSISTENCE OF VISION FILM FESTIVAL 28! Persistence of Vision Film Festival 29’s (POV29) provocative short films showcase the candid and diverse work of these fourth and third year emerging artists in the UBC Film Production program at UBC Theatre and Film. Twenty-one films, each 5 to 20 minutes long, range in genres from Science Fiction to Romantic Drama. Exploring timely topics through the confident gaze of their generation, their films take a step further to advocate authentic representation of various cultures. Women and people of colour fill over half of the key roles: Writers, Directors, Producers, and Directors of Photography with stories that contain powerful global reach. Filmmakers from Canada, China, Mexico, France, Turkey and more showcase different aspects of their dialect and diverse culture in their storytelling thus building the Canadian landscape. Past POV films have screened at multiple international film festivals including the Toronto International Film Festival, the Vancouver International Film Festival and the Cannes and Berlin Film Festivals. UBC Theatre and Film presents Persistence of Vision Film Festival 29 by UBC Film Production. Directed by UBC BFA fourth and third year students. Saturday, April 20: Doors open at 5:00pm, Program 1 – 6:00-8:00pm; Program 2 – 8:30-10:30pm, Frederic Wood Theatre, 6354 Crescent Rd, Vancouver, BC. Sunday, April 21, 2019: Doors open at 3:00pm, Program 2 – 4:00-5:50pm, Program 1 – 6:30-8:15pm, Frederic Wood Theatre. Awards Ceremony: Doors open 8:30pm, 9:00-11:30pm, The Great Hall, AMS Nest, 6133 University Blvd #1314, Vancouver, BC.